Back in February, I reported how Dem leadership in Sacramento apparently just wasn't all that into winning a 2/3rds majority this year. Turns out 4 months later, not much has changed. To review, thanks to redistricting and a new "open primary" system, Democrats have a realistic shot in 2012 at picking up the two seats in the Assembly needed to achieve a 2/3rds Democratic super-majority and overcome obstruction from Republicans. Without that super-majority, things will continue to deteriorate in Sacramento, with Democrats forced to make draconian cuts to education and the social safety net instead of finding ways to raise revenue to balance the California budget. "California voter approval of the Democratic-controlled legislature slinks along between 9 and 20 percent in recent Los Angeles Times and Field polls," writes former state Senator Tom Hayden in the Nation magazine. "Despite Democratic majorities in both houses and control of all statewide offices, the Democratic Party seems chronically unable to deliver the minimum that voters want from their government: results. College tuitions keep rising, and college doors keep closing. School funding keeps declining. Wetlands and redwoods keep disappearing. Billions spent on mass transit do not reduce congestion and air pollution. To a disillusioned majority, all the Sacramento fights appear to be about slowing the rate of California’s decline"
Mike Allen in AD10 (+35 democratic voter registration) and Betsy Butler in AD50(+33 democratic) together received 5x more money than Al Muratsuchi - a non-incumbent Democrat running in AD66 (+3 democratic) against two better-known and well-funded Republicans. He has received no money from the California State Democratic Party, while Allen and Butler combined have received over a $100K. Eric Bauman, Vice Chair of the California Democratic Party, believes it's a non-issue. 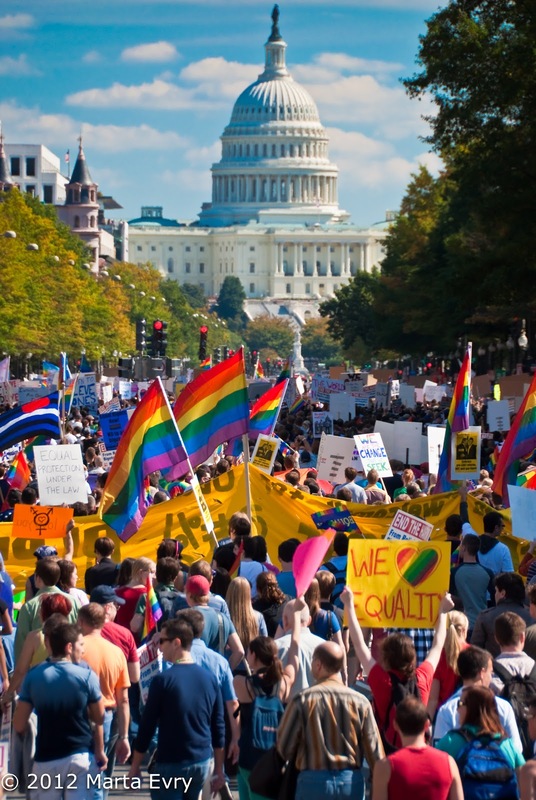 "Let's not get caught up in misunderstanding or distorting the challenge. Muratsuchi's race is a November race, not a June race - rest assured he'll be fully resourced in the general election." Rick Jacobs, founder of the California Courage Campaign, disagreed, raising concerns that throwing resources at safe Democratic seats would damage the CDP's credibility with grassroots activists. "So then comes the question as to why, given priorities statewide, the leadership raises and spends hundreds of thousands of dollars in AD 50. How does that inspire people to work hard and raise money for 2/3?" Susie Shannon who serves on the Executive Board of the CDP Progressive Caucus was similarly incredulous. "How do they expect to raise money from the grassroots in the future if they are just going to whittle it away on safe Democatic seats? Any way you slice it, the (money) spent on the Butler primary could have been saved for the Marutsuchi general election to defeat the Republican candidate, or any number of more productive endeavors. I would rather see this money going to overtime pay for the overworked CDP staffers." The question now is what happens after June 5th if "incumbent" Assembly democrats Butler and Allen end up running against "non-incumbent" Democrats in November instead of Republicans. Will Democratic candidates facing Republicans in other districts be, as Bauman promises, "fully resourced"? 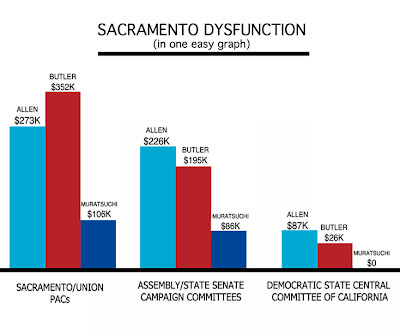 Or will Butler and Allen continue to take the lion's share of Sacramento's and the CDP's pie? "I would venture many thousands will be spent to support the candidates endorsed by the CDP, and that includes Butler and Allen," said Bauman. "The CDP and (Speaker John Perez's) priorities should be to make sure we have 2/3 majority so we could actually accomplish some important things like generating revenue, " said Agi Kessler, a delegate to the California Democratic Party and chair of the Democratic Party of the San Fernando Valley. Concerned that party leadership would waste money on Democrat-on-Democrat races throughout the state, Kessler and other democratic party activists circulated a petition at the CDP convention asking Assembly Speaker Perez to prioritize winning a legislative super-majority when allocating limited resources. They submitted nearly 300 signatures from fellow delegates. "As of today we've received no response from the Speaker or anyone in his office", said Kessler. While reading an LA Times story this morning on how the June 5th primary will be a key test for the state's new "top two" (aka "open", aka "jungle") primary, I was struck by a section on the 50th Assembly District race. In describing how candidates in districts with lopsided partisan registration used to be able to only have to worry about winning the party primary before coasting to victory in the runoff, the story uses the AD50 race as an example of how it's possible under the new rules for two members of the same party to square off not only in the primary, but in the November general election as well. In the 50th district, Democrats hold a 52% to 19% registration advantage over Republicans, while nearly 24% of voters are unaffiliated.....(Candidates) Osborn and Butler have raised more than $600,000 apiece, and most observers expect them to face each other in the fall. Richard Bloom has raised $260,570 and (Republican) Brad Torgan, $425. Osborn has sent out 10 political (mostly biographical) mail ads, starting in mid-April. Butler so far has sent three. Ritchie Ross, who is Butler's (campaign) consultant, said he and the assemblywoman have "plenty of gasoline left in our tank" for the remaining three weeks of the campaign. He added that voters in primaries usually don't pay attention until then. That statement from Ross is something to pay attention to. Why? Because three weeks before election day is exactly when campaigns start going negative. Something Butler's campaign consultant Ross is famous for doing. Dirty Deed: Writes mailer falsely linking Richard Katz to Latino voter suppression in Orange County, when Katz had actually defended voter rights, 1998. Katz loses state Assembly race by 29 votes to Alarcon. Quotable: "So am I as pure? No. Have I done my share of selling out? You bet. Have I done things that I'm not proud of? You better believe it." -- San Francisco Chronicle, September 2003. The Book on Ross: Plays to win at any cost, both financially and ethically. In fact, Ross' mailer for Alarcon was so inflammatory, Katz sued for defamation. More recently, working as a consultant for CA State Senate conservo-dem candidate Jason Hodge in the SD19 (Ventura) race, he's tried to misrepresent Hodges' more progressive opponent, Hannah-Beth Jackson, as a proponent of off-shore oil drilling. Endorsed by the Sierra Club and the California League of Conservation Voters, Jackson is considered an environmental champion. In the Assembly she was Chair of the Natural Resources Committee, Chair of the Environmental Safety and Toxic Materials Committee, and Chair of the Select Committee on Coastal Protection. She's repeatedly gone on the record as opposing oil drilling off the coast of California, even co-authoring a resolution asking the President to permanently ban any new offshore oil drilling. Yet despite this, Ross has worked overtime to paint Jackson as pro-drilling by exploiting Jackson's roll in a complicated and controversial negotiation for the Tranquillon Ridge project, which would have allowed the construction of a new oil platform off the coast of Santa Barbara in return for millions in oil extraction taxes and the closing of 4 other platforms in the same area. While the efficacy of that project is certainly up for debate, Jackson's intention was to decrease oil drilling, not increase it. Using it to say Jackson is pro-oil drilling is a blatant lie. One that Hodge and the campaign consultant he shares with Betsy Butler is more than happy to tell voters over and over and over again. Unfortunately, we can expect no less in the 50th Assembly District. I'm hearing rumors that Assembly Speaker Perez, alarmed by recent polling, is doubling-down on his investment in Butler, hiring canvassers and professional phone-bankers, as well as forcing his caucus members to cough up tens of thousands more to shore up Butler's campaign. Expect that money to translate into a barrage of negative mailers. Osborn certainly does, recently sending out an email to supporters urging them to volunteer to help her get out the vote. "Open primary, jungle primary, top-two primary -- whatever you call it, it means that we need every supporter on deck right now. In 26 days, the top two vote-getters -- either two Dems, or a Dem and a Republican -- will win the primary and head to the general election," wrote Osborn. "Our campaign's passion in the next few weeks will determine if I'm one of those two people. And, if I place #1, it puts me in strong position to win in November." Absentee ballots started going out last week. Yesterday, I reported how tenant advocacy and affordable housing groups in the 50th Assembly District raised serious concerns about an endorsement by the powerful rent control opponent group AAGLA for Betsy Butler. Today, Santa Monican's For Renters' Rights made public a May 3rd letter they wrote to Butler in reaction to the candidate's press release touting the endorsement. "This endorsement and your apparent enthusiasm for it will certainly sow doubt and mistrust for your candidacy among the renter voters of Santa Monica, West Hollywood, and West Los Angeles." The letter is signed by SMRR co-chairs Patricia Hoffman and Richard Tahvildaran-Jesswein. On April 25, Butler's campaign issued a press release touting an endorsement by the Apartment Association of Greater Los Angeles (AAGLA), a landlord and apartment owners lobbying group. “In her first term in the state Legislature, Assemblymember Butler has demonstrated a genuine understanding of the challenges facing the owners and managers of rental housing in California and has always taken a balanced approach to dealing with legislation affecting the industry,” said the association’s Executive Director, James Clarke. On its own website, AAGLA characterizes rent control as "socialized housing" and laments it was unable to stop this "disease" from spreading throughout the state in the 1970's. But it also celebrates a few notable victories - including the passage of Proposition 13, and its efforts to push through a vacancy decontrol law removing the ability of local communities in California to regulate rents. In the mid 70s, when Howard Jarvis was our Executive Director and vaunted Tax Reform Campaigner, we passed Proposition 13. In the mid 90s, our Sacramento Lobbyist, Steve Carlson helped draft and pass the Costa-Hawkins Law that protects our members (allowing rent increases upon vacancies) and saving the businesses of countless owners in Santa Monica and West Hollywood and apartment owners across the state from the worst most unreasonable unfair rent control laws. Rent control advocacy groups - including SMRR and the Coalition for Economic Survival (CES) - say AAGLA's endorsement ought to raise red flags for renters in the 50th Assembly District. "AAGLA endorsements are based on the candidates they believe would be more supportive of landlord issues and will vote on bills of concern to them," said Larry Gross, executive director of CES. "They clearly believe that Betsy is a better candidate for landlords than (her opponents). This is a very important factor that tenants should keep in mind when they cast their ballots on election day in the 50th district Assembly race." "To say AAGLA creates affordable housing is a real misuse of the term, " said Hoffman. "AAGLA has never provided affordable housing for low income renters unless forced to by inclusionary housing laws." SMRR has endorsed Butler's opponent Torie Osborn in the AD50 race. Renters are the majority in the 50th Assembly District. In Santa Monica, renters make up 70% of residents, in West Hollywood it's 78%, and in Hollywood, the percentage of renters soars to 92%. Sometimes a picture (or two) is worth a thousand words. "Never give in. Never give in. Never, never, never, never--in nothing, great or small, large or petty--never give in, except to convictions of honor and good sense. Never yield to force. Never yield to the apparently overwhelming might of the enemy." Prominent tenant advocacy and affordable housing groups in the 50th Assembly District say Betsy Butler' endorsement by rent control opponents raises serious concerns about her commitment to protecting tenant rights. 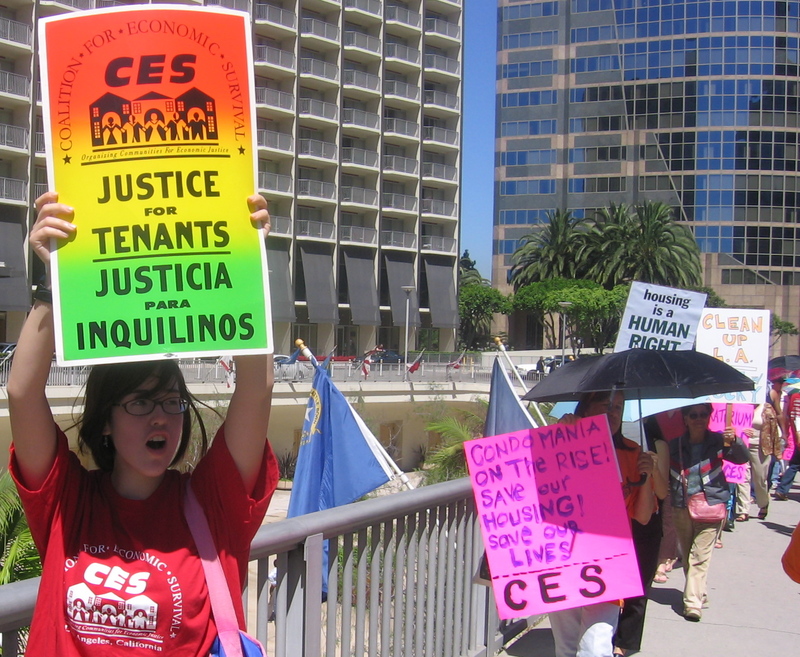 Rent control advocacy groups - including Santa Monicans For Renter's Rights (SMRR) and the Coalition for Economic Survival (CES) - say AAGLA's endorsement ought to raise red flags for renters in the 50th Assembly District. Renters make up the majority in the 50th Assembly District. In Santa Monica, renters make up 70% of residents, in West Hollywood it's 78%, and in Hollywood, the percentage of renters soars to 92%. Interestingly, in Betsy Butler's current Southbay district, (with the exception of Marina del Rey and Venice) the opposite is largely true. In Redondo Beach half the residents are renters, in Torrance, only 44% or residents are renters, and in Manhattan Beach, only 35% rent. Former West Hollywood City Councilman Steve Martin raised similar concerns in an op-ed he wrote for WestHollywoodPatch.com. Butler’s touting of the Apartment Association endorsement reflects a tin ear to our local concerns that is probably a result of the fact that Butler is a South Bay politico", wrote Martin. "For Betsy Butler, rent control may seem to be something of an esoteric or philosophical issue. But to many Westside tenants, rent control is a question of protecting our homes." And Now For Something Completely Different: Behind The Scenes Photos From "Castle"
So, when I'm not hip deep in the muddy world of local/state/national politics, my day job is to make the world safe for television. My current gig - the best I've ever had - is on the ABC-TV show "Castle". Tonight is the season 4 finale, so as a treat for fans and friends alike who wonder what the heck it's like to be behind the scenes of the show, here are a few photos I hope you'll enjoy! Can't see the photos from your mobile device? Go to this link. More details are emerging about the the DA's probe of John Duran's city credit card use, turning the case into a cautionary tale of "Be careful what you wish for, because you might just get it." As the LA Times reported yesterday, the LA County district attorney's Public Integrity Division launched into an investigation of city employee credit card use when supporters of Duran and challengers to an incumbent slate of City Council members filed a complaint during last year's contentious election campaign. After a community activist made some of the expenses public last year, West Hollywood took away council members' credit cards and tightened controls on spending. The Times has since reviewed hundreds of pages of expenses accrued by Duran and other council members. However, during the course of the DA's investigation, it cleared all the original targets of the complaint, then set it's sights on a new person of interest - former WeHo mayor and current council member John Duran. Demerjian said the meal expenses of other council members "paled in comparison" to Duran's expenses. As first reported in West Hollywood Patch and this blog, Duran responded to the investigation by setting up a legal defense fund and hiring a criminal attorney. He's the only person of interest in the probe to do so. "The City has been informed that the District Attorney has completed its investigation as regards the City and its employees and the City does not expect any further action by the District Attorney with respect to the City or City employees," continued City Attorney Mike Jenkins. "The District Attorney has not informed the City of the specific allegations being made against Councilmember John Duran, so the City cannot comment at this point on the District Attorney’s inquiry." The intense media focus on the DA's investigation comes at an inopportune time for one candidate running in the 50th Assembly District race, Betsy Butler. Duran was the only West Hollywood official quoted in Butler's press release announcing her candidacy for the 50th Assembly district. As recently last week, he co-hosted a major West Hollywood fundraiser at the home of supporter Jeanne Dobrin. 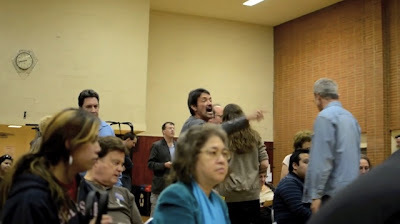 In January, Duran, a key supporter of AD50 candidate Betsy Butler, infamously blew up at Butler's opponent, Torie Osborn, during the West Hollywood/Beverly Hills democratic club endorsement meeting after Butler lost the club's endorsement in a close vote. Ironically, Osborn's campaign was prepared to accept a dual endorsement of both Butler and Osborn as recommended by the club's board, when long-time club member and Butler supporter Jeanne Dobrin inexplicably demanded a vote be called to deny the dual endorsement. Dobrin's motion led to a series of votes which ultimately resulted in Osborn walking away with the club's sole endorsement. West Hollywood Patch is reporting today that a key endorser for AD50 candidate Betsy Butler, WeHo City Councilman John Duran, has set up a legal defense fund and hired a criminal defense attorney after meeting with the district attorney's office regarding an inquiry it launched in 2011 about possible misuse of city credit cards. West Hollywood City Councilman John Duran has set up a legal defense fund in the event the Los Angeles County district attorney’s office decides to file criminal charges against him for improper use of his city credit card. Duran had charges for 128 meals from 2008 to 2010 totaling approximately $7,000. Patch is also reporting Duran hired criminal defense attorney George Bird to represent him. “John Duran is an honest, decent public servant who at all times conducted himself ethically and within the bounds of the law,” Bird reportedly told Patch. 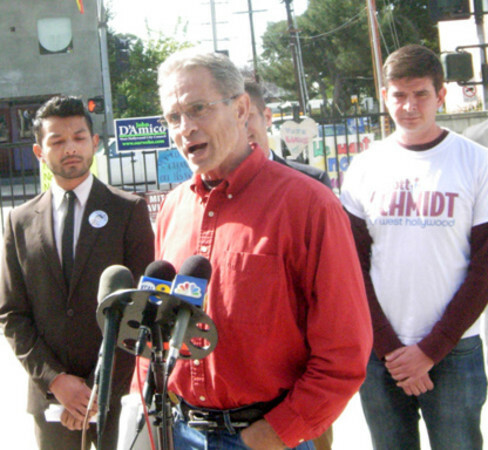 The probe was originally launched when WeHo resident Ed Buck reportedly filed a complaint during the heated 2011 City Council elections alleging that some incumbent Council members and their staff had racked up $13,000 worth of improper charges on city credit cards. Local activist Ed Buck, who uncovered the documents after a prolonged public records request, said he is glad the DA is conducting the inquiry. Buck noted that there have been rumors about City Hall misuse of credit cards circulating for years, but no one could ever prove it. While the DA's initial probe included what Patch characterized as a "wide range" of documents from City Hall, in late August of 2011 the DA's office began to narrow their focus, requesting additional documents from Duran as well as two other city employees. Duran is the only person of interest in the probe who's announced setting up a legal defense fund or hiring a criminal defense attorney.